How do Major League Baseball managers gain the trust and respect of their players, overcome challenges on and off the field, motivate a diverse team, communicate their vision, and create a winning culture? From 2012 to 2014 we set out to answer these questions and identify how people outside of baseball can develop their own leadership using stories and strategies used by managers in the Major Leagues. We conducted over one hundred interviews with MLB players, managers, and executives, and identified ten dimensions of leadership, which, when possessed by MLB managers, led them to have the greatest impact on those around them, and be the most successful in achieving their goals. We call these ten dimensions of leadership, the Ten Bases of Leadership, and grouped them into three main categories, the need to lead ourselves, the ways we can lead others, and the importance of leading our game (no matter what that game may be). These bases became the foundation of the book, Lead Me Out to the Ballgame: Stories and Strategies to Develop Major League Leadership, and the first three bases of leadership, the ways we lead ourselves, are explored here. In order to lead ourselves we need to first find our passion. We won’t be as successful leading an organization or spearheading an idea if we don’t have passion for it, and we won’t engage or inspire those around us unless we show that passion to them. Think about it, what engages and inspires you? In many cases it is seeing someone else’s excitement and passion, as passion and excitement can be contagious. In Major League Baseball managers display their passion in different ways. One example is Texas Rangers manager, Ron Washington, who can often be seen doing the ‘Washington Shuffle’ and dancing around the dugout when his players get a hit or run the bases. Granted in a business setting we may not feel comfortable dancing around a cubicle or in a conference room, but there are other ways to demonstrate passion and inspire those around us as well. We can smile when we talk, make public announcements about a challenge overcome, cheer on our team as they tackle a tough project, etc. It’s up to each individual to determine how to best convey their passion in their environment, the key is that it is important to do so. The second base of leadership is to lead by example. As Mike Scioscia, manager of the Los Angeles Angels of Anaheim told us, “If you want to be a leader, the first person you have to lead is yourself.” To be a leader who is followed it is vital that you are trusted as well as respected. If you are followed simply because of the position you hold, you will be followed just enough not to get fired; If you are followed because you are trusted and respected, you will be followed unconditionally. Major League Baseball players throughout the league told us that they admire managers who are consistent and managers from whom they know what to expect. John Farrell, manager of the Boston Red Sox told us, “you’ve got to have a credible message, you’ve got to be consistent, and there’s got to be an awareness.” In other words, the manager needs to be consistent with the message he is sending so that members of the team know what to expect. Respect is the last base of leadership in the category of leading ourselves. To be an effective leader we need to earn it, show it, and give it to those on our team. The thing about respect, as former MLB manager Davey Johnson told us, is that it doesn’t matter how long you’ve been in the ‘game’, you need to earn the trust and gain the respect of your people every day. Gaining respect is not a difficult thing to accomplish, but it can be an easy thing to lose! We gain respect by staying true to our word, being honest with our people, and letting them know that our intentions are in the best interest of our team and also each individual on it. Sometimes, as Bob Melvin, manager of the Oakland A’s told us, your players will not be happy with what you tell them, but if you are honest with them they will respect you for it. On a baseball team or in the boardroom, the people who count on you, as well as the people you count on, may not always make decisions that you agree with, but if you have trust in the decision maker you will be more apt to offer support for, and do what is necessary, to bring about a win for your team. The way to cultivate a winning culture is by establishing yourself as an expert in your field, modeling the behaviors you want your people to emulate, demonstrating respect, and allowing your people to have a voice in the clubhouse. MLB coach and former manager Alan Trammell told us that most managers and coaches have an assumed expertise because they are former players, but there is more to earning respect than that. “They know that we played, and that’s all fine and dandy, but that can only go so far, they get tired of hearing the old stories of stuff. If you’re phony and all you’re doing is telling stories but not working, they see right through that.” At all levels and in all industries, stories only go so far. As is often heard, actions speak louder than words. To develop Major League Leadership, we need to first lead ourselves: find and demonstrate our passion, lead by example, earn the respect of those around us, and show that same respect to those on our team. The bases of leadership don’t differ by industry, but how we execute them depends on how we lead ourselves. 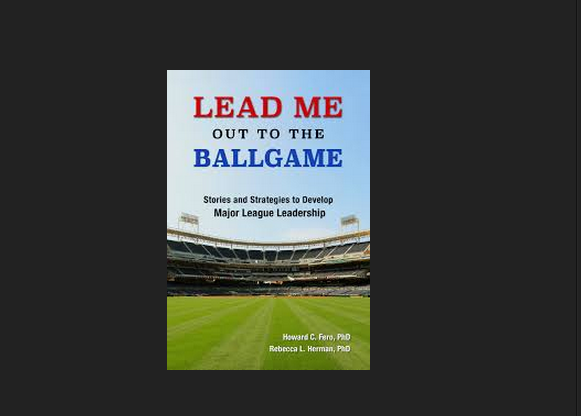 Howard C. Fero, PhD, The Leadership Doc, is a leadership speaker, professor, consultant, executive coach, and co-author of LEAD ME OUT TO THE BALLGAME: Stories And Strategies To Develop Major League Leadership. He is the Director of Graduate Leadership Programs and an Associate Professor of Management and Leadership at Albertus Magnus College in New Haven, CT, and was recently recognized as a Business New Haven Rising Star. Rebecca L. Herman, PhD, is a leadership professor, transformational speaker, passionate volunteer leader, baseball blogger, avid photographer, and co-author of LEAD ME OUT TO THE BALLGAME: Stories And Strategies To Develop Major League Leadership. Dr. Herman is a Professor of Leadership and Organizational Development for Kaplan University’s School of Business graduate programs. For more information please visit www.majorleagueleadership.com.